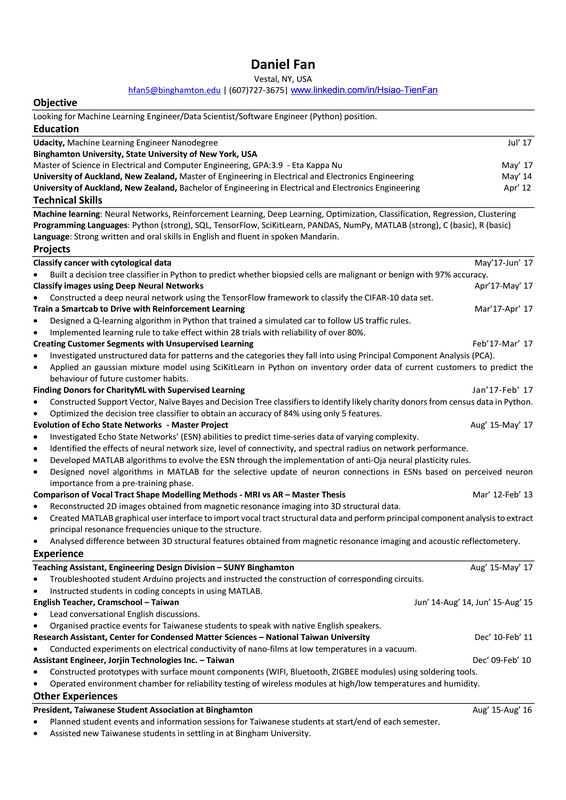 I am a recent Master graduate actively seeking employment in Machine Learning Engineering. •	Built a decision tree classifier in Python to predict whether biopsied cells are malignant or benign with 97% accuracy. Classify cancer with cytological data by Daniel F.
Train a Smartcab to Drive with Reinforcement Learning by Daniel F.
Creating Customer Segments with Unsupervised Learning by Daniel F.
Finding Donors for CharityML with Supervised Learning by Daniel F.
Evolution of Echo State Networks - Master Project by Daniel F.
Comparison of Vocal Tract Shape Modelling Methods - MRI vs AR by Daniel F.